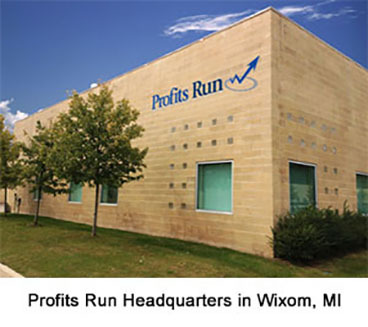 Profits Run is located in Wixom, Michigan, a tiny suburb about 40 minutes Northwest of Detroit. This is where most of our team works from. Our normal business hours are Monday through Friday, 9am to 5pm Eastern time. If you'd like to call us, you can reach us toll free at 888-303-4440 or 248-344-4440. The absolute fastest way to ask a question and get a reply is to send an email to support@prtradingresearch.com. Our fulfillment center is located in Terre Haute, Indiana, and our coaching department is located in West Jordan, Utah. Most of our websites have a "Live Chat" button that will allow you to ask questions live during normal business hours. The button will say "ONLINE" if someone is available, and it will say "OFFLINE" if it's outside normal business hours, if we had to step out for a minute, or if we're in an infrequent meeting.